The monthly ArtSmart Roundtable brings together some of the best art-focused travel blogs to post on a common theme. This month we are discussing Art and Nature. Check out all the stories below! Nature has inspired some of the most amazing art – from the representational, majestic landscapes of the Hudson River School to the stylized, curling flowers of the Art Nouveau. A painted landscape was one way to bring the environment back into our homes. The Arts & Crafts movement went one step further and sought to bring the beauty of nature inside and incorporate it into our furnishings and decorations. 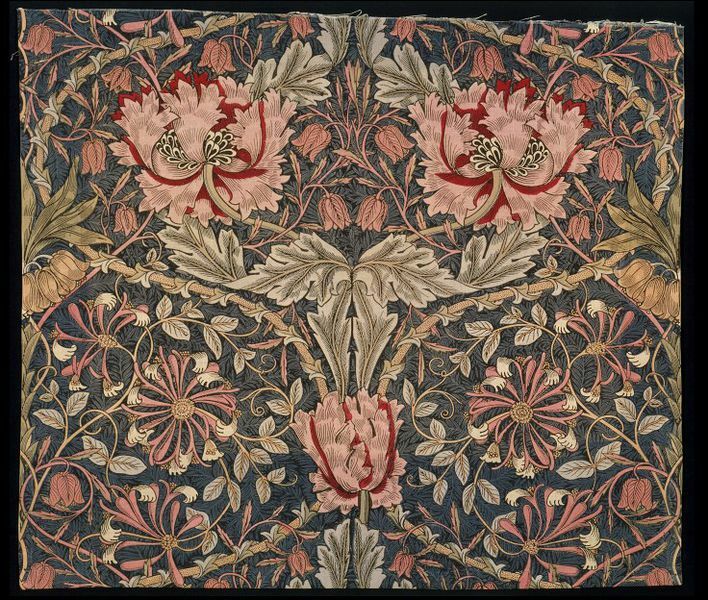 No one did more to turn parlors into romantic gardens like the British designer William Morris. The Western world was radically transformed in the 19th century. In addition to the new booming urban centers, industrialization changed how people earned a living and introduced new, affordable factory-made products into the home. As a backlash to this cheapening of labor and goods, some artists and critics expressed a desire to return to a more noble time when skilled crafts were celebrated which give rise to the Art & Craft movement. While the advocates of this movement were later connected with political socialism, Art & Crafts was largely a design concept that sought out natural and pure motifs along with superior care and execution. 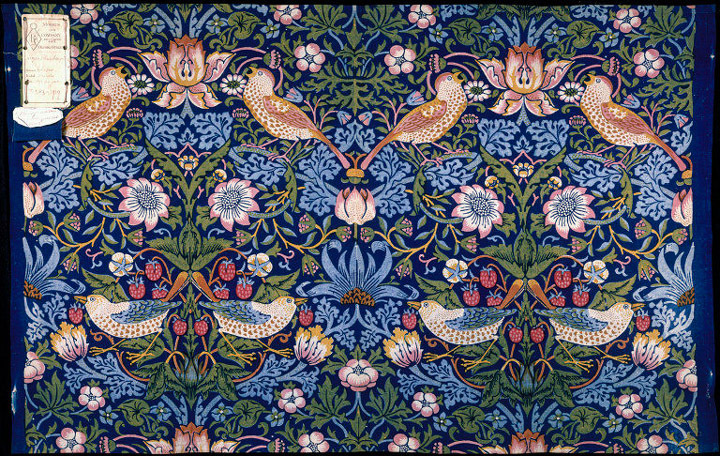 The UK’s William Morris (1834 – 1896) emerged as one of the great Art & Crafts visionaries. He was both a colleague and friend of the Pre-Raphaelite Brotherhood which included Dante Gabriel Rossetti. These artists rejected Renaissance formalism choosing to work with deep shadows offset with fine details for a magical, brooding effect. Their subject matter and design motifs pulled from medieval and Shakespearean sources. These historical influences can be seen in Morris’ work as well, but he focused purely on the graphic design elements of this period without including the emotional and mythological themes that the Pre-Raphaelites embraced. 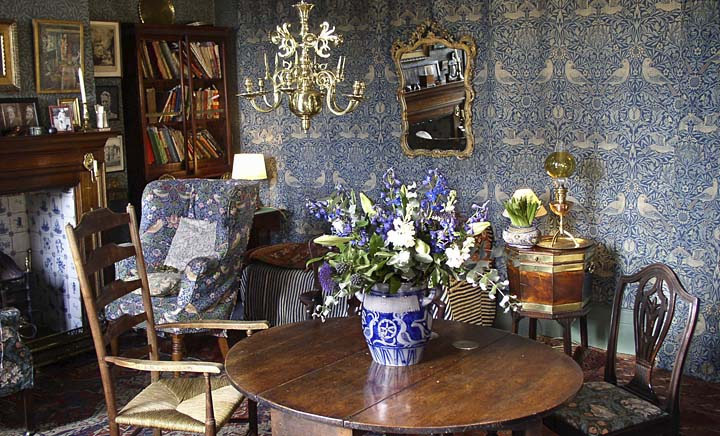 As an interior designer, Morris focused on decorative arts. He designed wallpaper, textiles, furniture, interior architectural elements, and stained glass windows. 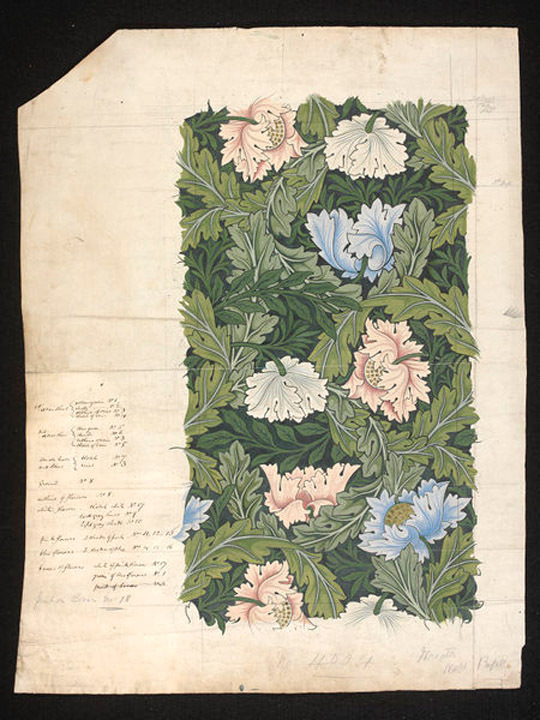 To create these gorgeous patterns, Morris drew out a block design which would be repeated during production. Wood block printing was used for the wallpapers and for some textiles. Morris had to use modern, mechanized weaving for most of his fabrics but, true to his artisan philosophy, he only used natural dyes even though many synthetic colors were available in Victorian England. 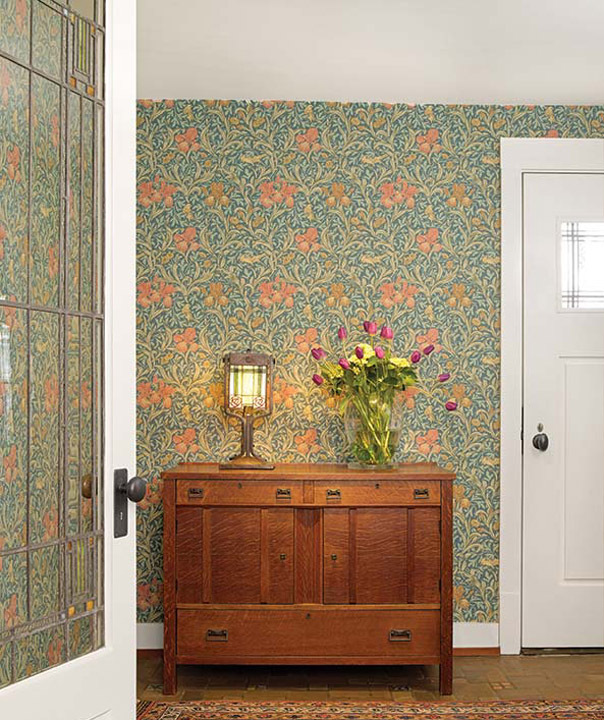 This organic color scheme enhances the naturalism of Morris’ flowers, vines, and leaves. Ultimately, Morris & Co. created over 600 fabric and wallpaper designs which are still popular today for their utilitarianism, harmonious graphic design, and profound ascetic appeal. 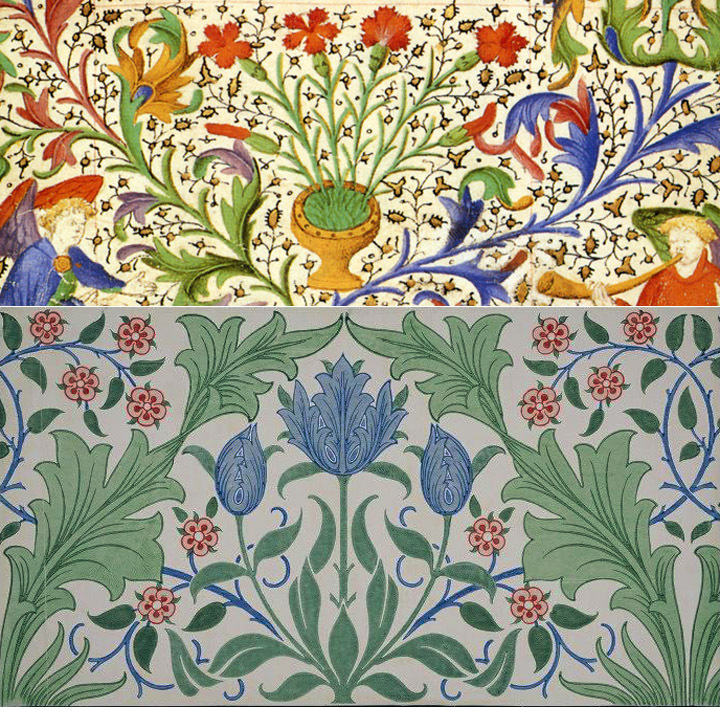 I definitely see the influence of medieval art in Morris’ work. There is a similar simplicity in the forms of flowers and greenery as I’ve tried to highlight above. Manuscript painters of the Middle Ages often added accent lines of darken pigment to create depth and three-dimensionality. 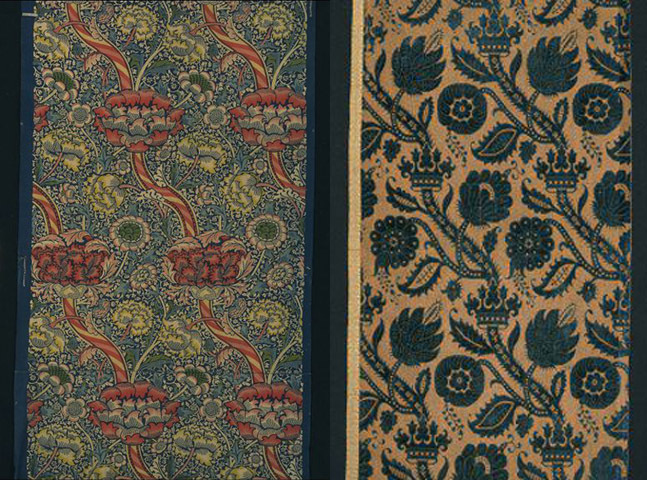 Condensing this effect, Morris utilized bold outlines and deliberate accents. His designs are also colorful and use contrasting colors like pink on a black background, or red on green. The Victoria & Albert Museums also points out an interesting similarity between a 16th century textile from Genoa in their collection and the “Wandle” pattern by Morris. At the time this Renaissance velvet was acquired by the museum, Morris was helping select pieces for the institution to purchase. 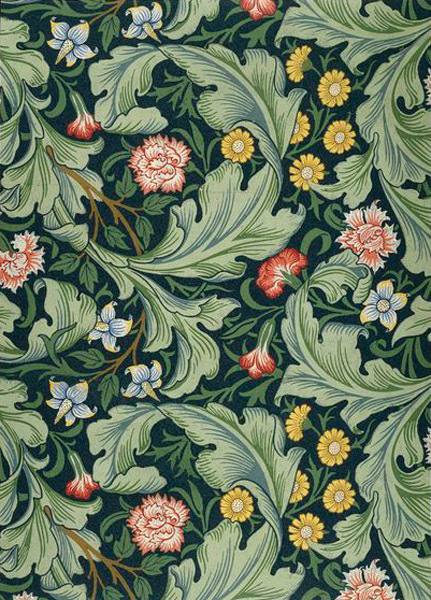 The winding vine and rhythmic pattern of huge blooms has clearly influenced Morris’ fabric design. Perhaps William Morris captured a little more romance from the Pre-Raphaelites than I had originally given him credit for. His designs have a lushness and vibrancy that truly change a room. The vegetation is natural and dense but idealized which means that you get all the loveliness of a flowering garden without any of the bugs. Pal & Lydian of Art Weekenders – coming soon! Ashley of No Onions, Extra Pickles – coming soon! Interesting post. Oddly, I was sent back to my Mughal Indian art class where we learned about some intricate styles such as that on the Agra Fort. I think it is the busy detail, however Morris’ is much more stylized for British tastes but entirely possible he drew from both Medieval and Indian art from nature.